WEEK IN GEEK: With D. Bethel back in the saddle, our hosts settle back into routine. Andrew discusses playing the forgotten entry in the Assassin’s Creed oeuvre, Assassin’s Creed Rogue, and its strange and bold narrative through-line through more than a few other AC games. D. Bethel snuck in some mobile gaming while he was supposed to be grading and fell in love with the vocational routine of the giant robo sim, Last Colossus by Game Stew. Episode 77 – That’s Not A Euphemism: Where Andrew discusses playing Assassin’s Creed IV: Black Flag. Episode 93 – The Clay Man Incident: The episode named after the Clay Man debacle from Dan & Andrew’s 7th grade art class. Thus began a friendship. Shortcast 18 – Magic Incarnate: Where D. Bethel is impressed by the pilot to the Starz show (now cancelled) Ash vs. The Evil Dead. Episode 139 – A Warm Heat: Where Andrew is also impressed by the first season of Ash vs. The Evil Dead. Gunnm (or Battle Angel Alita, stateside) is a manga and anime with a cult following, deep history, and a rocky path to big-screen adaptation. The manga was written and drawn by Yukito Kishiro over the course of five years and nine volumes. Early in its run, it was adapted into an Original Video Animation (OVA) comprised of two half-hour, stand-alone episodes (based on the first two manga volumes) that were sold together on VHS, initially. In the states, the OVA (retitled to simply Battle Angel) had a large audience due to its emotional story and cyberpunk stylings, and gathered enough of a reputation to attract the interest of James Cameron, who eventually bought the film rights. Set several centuries in the future, the abandoned Alita (Rosa Salazar) is found in the scrapyard of Iron City by Ido (Christoph Waltz), a compassionate cyber-doctor who takes the unconscious cyborg Alita to his clinic. When Alita awakens she has no memory of who she is, nor does she have any recognition of the world she finds herself in. Everything is new to Alita, every experience a first. As she learns to navigate her new life and the treacherous streets of Iron City, Ido tries to shield Alita from her mysterious past while her street-smart new friend, Hugo (Keean Johnson), offers instead to help trigger her memories. A growing affection develops between the two until deadly forces come after Alita and threaten her newfound relationships. It is then that Alita discovers she has extraordinary fighting abilities that could be used to save the friends and family she’s grown to love. Determined to uncover the truth behind her origin, Alita sets out on a journey that will lead her to take on the injustices of this dark, corrupt world, and discover that one young woman can change the world in which she lives. Disregarding the nearly twenty year wait since the film rights were purchased where the fan anticipation has done nothing but build, the now-titled Alita: Battle Angel has another hill to climb given the context into which it will be released. Western adaptations of manga/anime doesn’t have a deep history, but, when it does happen, it tends to not do well. However, the most recent attempt, 2017’s Ghost in the Shell, was a cultural disaster as much as it was a box office stumble. Surely, with that still weighing heavy on the minds of fans and producers alike, it seems likely that Alita will be met with severe skepticism. Ido has his rocket hammer, so Dan is happy. Source: 20th Century Fox. Optimistically, it has some elements that work for it that actively worked against Ghost in the Shell. For one, all iterations of Battle Angel take place in a far future United States; so, aside from the general appropriation of a story originally written and drawn by a Japanese artist, the wide-scope white-washing that occurred in Ghost in the Shell seems avoidable in this case. In the small scale, the father-figure character from the manga and OVA, Daisuke Ido, has had Austrian-German actor, Chrisoph Waltz, cast in the live-action adaptation; the character has been renamed Dyson Ido, so the criticism can’t be wholly avoided. Second, translated editions of the manga and the OVA have been widely out of print for awhile, so Battle Angel doesn’t have as much presence in the cultural zeitgeist as Ghost in the Shell had with its classic manga, multiple movies and television shows. If anything, because of this, Alita: Battle Angel seems to be in a good position to be released without much fear of controversy. The manga was brought back into print in English by Kodansha Comics in May of 2017, but it still remains to be seen if the long out of print OVA will see a new release, either on Blu-Ray or on digital services. A re-release seems likely as a marketing move to raise anticipation for the film’s release. While fan reaction to the trailer has yet to be aggregated here, it’s clear that Rodriguez and his team are making interesting choices that could go either way with fans of Battle Angel and sci-fi movie fans in general. There is the digital deformation of actress Rosa Salazar to make her appear closer to how Alita (or Gally, in Japan) looks in her original representation. Whether this technique is applied to other characters––both main and incidental––throughout the remainder of the movie may be the line between acceptance or rejection of this choice by fans. As mentioned previously, the westernization of Ido by casting Waltz in the role could lead to controversy, but that remains to be seen. Canonically, his character is less tied to the cultural origins of his name in the story and more to the mysterious Zalem (in Japan, or Tiphares in the States; Battle Angel is a veritable totem for how wacky things can get when translating texts for the sake of localization), a city occupied by the wealthy and entitled that ominously floats above Scrapyard, where Battle Angel‘s story takes place. Therefore, Ido’s race-change may be a non-issue, at least within the context of the story. All that being said, after almost twenty years of being in development hell, it is refreshing and curious to see a property surface from the mire, at the very least. We’ll have to wait until July to see how much of the mud has stuck. WEEK IN GEEK: In a fit of nostalgia, Andrew picks up The Sims 3 again (starts at 1:49) while Dan can’t get past a nit-pick to enjoy anything Netflix’s Castlevania has to offer (20:46). SDCC 2017: [starts at 34:04] It was a big weekend for nerd culture as the San Diego Comic Con dropped a bunch of new trailers on the world. Dan and Andrew look at three trailers and how they seem to be pointing out the creative direction of their respective studios with Marvel’s Thor: Ragnarok, DC/Warner Bros.’ Justice League, and Steven Spielberg’s Ready Player One. For reference, here are the three trailers the discussion focuses on. Episode 29 – “Guitar Mode”: Andrew discusses reading the Ernest Cline novel, Ready Player One. Episode 42 – “Unology”: Dan and Andrew discuss the announcement that Steven Spielberg would be adapting Ready Player One as a film. 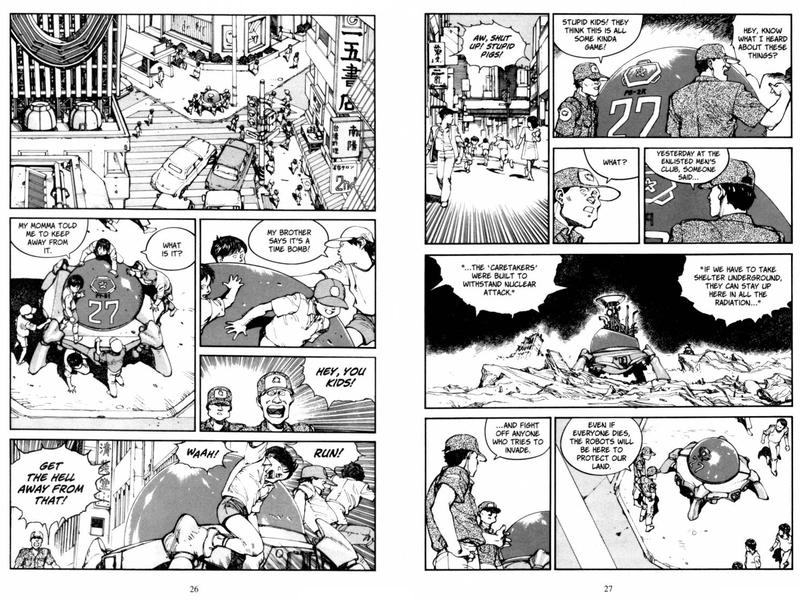 D. Bethel looks at the first volume of Katsuhiro Otomo’s Akira manga and finds in its pages much more than a commentary on nuclear war. Akira, as an anime and manga series, is arguably better known for being a groundbreaking work than for the story it tells (variable as that may be, depending on the medium). From presentation to content to technology and themes, Akira has earned a place in the cultural discourse of not only Japan but the rest of the world as well. As I mentioned on the podcast, I have come to Katsuhiro Otomo‘s manga after having seen the anime, which I’m sure is the course most westerners took since the movie was such a significant event, especially in the nerd world. Now three volumes into the story, I have already seen a significant diversion in narrative between the manga and anime, to the point that the movie feels less like an adaptation and like a new story using the same players. This difference intrigues me to the point that I found myself down the hole of an academic database search for any criticism about Akira. Not surprisingly, the discourse around both the anime and manga nearly unanimously focuses around its use of imagery related to nuclear weapons and Japan’s historical tie to them. While not wrong nor an insignificant approach to the work, I feel that using a small lens on such a large work misses out on a lot of fantastic critical angles. Also, when conversations around Akira happen in person (with friends or fellow fans) and the group wants to take it to serious territory, it seems the only road to travel is the one that leads to nuclear warfare and its relation to Japanese history as well. One of the most crucial tenets of literary analysis and critique is that texts don’t have a single meaning or purpose. Moreover, meaning can change over time because the needs of the cultures that consume literature change as well, and texts that don’t maintain some sort of relevance, I would argue, fall away. It’s sad, perhaps, and some hold onto, teach, and love texts only for their historical relevance. There’s nothing wrong with that, but it’s the relevant applicability of texts that makes them still feel important and impactful to an audience and culture, which is a much stronger response than just reverence for it. Part of the fun of literary analysis comes from devising a thesis and seeing if any sustaining evidence rests inside the text. When it comes to Akira, it seems that only one thesis is pursued, if not allowed, and everyone takes part in the Easter egg hunt. Like any other text, analysis should be less like an Easter egg hunt and more like a scavenger hunt, but everyone has their own goal and their own list and all hunts are happening in the same place. Perhaps because I had always heard the nuclear conversation around Akira, and drew the same conclusion on my first viewing––it was probably the first movie that really presented the allegory to me before ever seeing things like Godzilla or more art house fare like Akira Kurosawa’s Dreams––it wasn’t on my mind when I cracked open the first volume of the manga so many years later. I had no desire to find more evidence about Otomo’s commentary on post-nuclear Japan because, perhaps, I was sure it was there, dripping off of every line. In a sense, that hunt was over because, in a finite work, all the eggs had been found. It put me in a wonderful space when approaching a text: free of expectations. Youth gone wild, basically that Skid Row song interpreted in comic form. What sticks out in this story from the beginning (from the first page, though you don’t know it yet) is that its characters are teenagers. These youths have grown up in a post-apocalyptic world as the book starts with what looks like a nuclear event detonating in the heart of “the metropolitan area of Japan,“ which ignited World War III. The story picks up nearly forty years later. Those who were in the war are middle-aged and the teenagers have never known a country without a big hole in the middle of it. World War III isn’t even a part of their memory; it’s just another chapter in their education (if they pay attention). Though it’s not a Mad Max desert-scape––Neo-Tokyo has familiar sky-scrapers and cool future technology as well as the expected slums and people doing their best to make their way––its society is in just as much turmoil. It’s just beneath the surface and bubbling to the top through these kids. In a post-nuclear and post-World War society, Neo-Tokyo exists in the static created by a paranoid and strictly regulated government and a generation that has no living memory of what created that paranoia in the first place. Teenagers in Akira are nihilistic and quick-tempered and angry. (I can already hear you saying, “Oh, so you mean a normal teenager?” I get it.) But––to connect it with the more traditional reading of this book––in a post-nuclear and post-World War society (and for Japan, this has now happened twice by the events within the book), Neo-Tokyo exists in the static created by a paranoid and strictly regulated government and a generation that has no living memory of what created that paranoia in the first place. This is tempered in the way adults and youths interact. Most of the time it’s polemical adults exploding in hyperbole (or sometimes physical violence) without any respect to or awareness of the kids’ intelligence. This is probably unintentional on the part of the adults; they’re stuck in the tautology of thinking the kids don’t understand because they weren’t there, so they can’t understand, so they must be told––but they won’t understand! The kids, in turn, are frustrated because despite the fact that they live in a world they are bound to inherit, the shadow of the explosion and the war looms over everything in their culture. Because the adults are so tetchy and repressed (because that is how they keep the world from falling apart again), the kids never really learned how “to articulate any meaningful relation between themselves” and the world they live in (Lamarre 138). It reminds me a bit of Victorian manners in their treatment of children––the whole “seen but not heard” ethos that leads to severe problems down the line. Such treatment and behavior, of course, doesn’t pacify the youth; in fact, it weaponizes them, which is literally what Akira is about in terms of plot. But even in terms of plot, it is the teenagers in the story that activate every movement forward; they are the only ones that have any narrative agency. All the adults do (so far from what I’ve seen) is stand and watch the kids disassemble what structure adult society has been trying to hold together and yell at them as they do so. The titular Akira (and a few others like him) is a mere boy who can do city-wide destruction by just being. It’s almost as if the momentous destruction previous generations had to build and fall victim to has become a natural, unconscious part of the new generation (albeit Akira and his crew have been subjected to horrific experiments). It’s a powerful statement on youth culture striving to not only survive but learn in a society that goes through the motions of trying to educate and instruct, but is actively pursuing the opposite. Page 26 & 27 from Akira, volume 3. Read from left to right. Click to enlarge. Previously, we saw the Caretaker robots “pacifying” the adult looters by gunning them all down with ordnance so powerful it annihilated not only the looters but also the storefront they were stopped at. In the scene with the children, they relay the fact that they know these things mean business, but they play anyway. They only leave because they don’t want to deal with the soldiers/police, probably because in this Code Seven environment, they might end up on the wrong end of sanctioned lethal force. They don’t leave because they are scared; that much is clear on the faces of the children on the last panel of page 26. Running from the military/police is part of the fun they’re having. If they were scared, they wouldn’t yell the derogatory insults as they left (panel 1 of page 27). Just as the adults are using the tools they have at their disposal to create a sewn-up, paranoid, and violent society to keep it safe, so are the kids using the tools at their disposal to have a childhood in spite of it. Climbing all over a death robot while playing with friends isn’t dangerous––it is to the adults who see them doing it. To the kids, that’s normal. In that sense, it reminds of Mad Max: Beyond Thunderdome where the ways the residents of Bartertown repurpose “old world” items into new things differ vastly from how the Child Tribe repurposes items; they are doing the same thing but what they do with them is disparate from the other. The way the world is defined for both parties is extremely and intrinsically different. So, yes, the devastation of World War II strongly grips this book, but such discussion exists on a macro, holistic scale. It diminishes the struggle these kids are going through. They don’t want to have that conversation because it’s been the only conversation that’s ever been had throughout their entire lives, which is a handy metaphor for the discussion around Akira itself. Lamarre, Thomas. “Born of Trauma: Akira and Capitalist Modes of Destruction.” positions: east asia cultures critiques, 2008, vol. 16, p. 131-156. Bolton, Christopher. “From Ground Zero to Degree Zero: Akira from Origin to Oblivion.” Mechademia, 2014, vol. 9, p. 295-315. Nelson, Lindsay. “Embracing the Demon: The Monstrous Child in Japanese Literature and Cinema: 1946-2008.” Diss. University of Southern California, 2012. Web. Week in Geek: Andrew simulates walking in Gone Home whereby he ponders how this mechanic has future ludic applicability; he also starts playing the strange but intriguing indie game, The Bridge. Dan reads volume 1 of the manga, Akira, upon which the classic animated film is based. Leave your thoughts about this week’s topics as comments at forallintents.net. Be sure to join the official Facebook page for exclusive links and conversations and updates. Please leave a review of the show on the iTunes store, which will help spread the word to new potential listeners. For all intents and purposes, that’s an episode recap. SPOILER ALERT: Dan and Andrew go into detail about the plot of Star Wars: The Force Awakens in this episode. So, if you haven’t seen it, please refrain from listening. You have been notified. The new year is brought in an…interesting…fashion. Base humor and extended conversations are but a small step into 2016! Week in Geek: The boys play some catch up as Andrew plays Assassin’s Creed IV: Black Flag and Dan watches Cowboy Bebop. The Force Awakens A Lot of Opinions: The movie that caught the world’s imagination is under the lens this week, though both Dan and Andrew come to Star Wars: The Force Awakens from very different places with very different attitudes. It is a movie that has been universally praised but severely dissected among the fandom. Andrew and Dan dissect the schism as well as offer bits of their own insights into this, overall, fun movie. If you want to respond to any of the topics discussed this week, you can leave a comment on the page for this episode at forall.libsyn.com. Be sure to join the official Facebook and Google+ pages for exclusive content and discussion. You may also e-mail any questions, comments, or concerns to forallpod [at] gmail [dot] com. Be sure to leave a review on iTunes to help spread the word to new listeners through the magic of Apple’s algorithms.